Reese's peanut butter eggs are a must have Easter Basket candy. 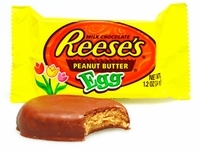 A creamy peanut butter shaped egg covered with Reese's milk chocolate. Everyone loves these eggs at Easter time, although very similar to a Reese's peanut butter cup these eggs just hop away at Easter. If you just love the creamy smooth peanut butter eggs and one just won't be enough, no problem you can also get your favorite Peanut Butter Eggs in a 36 count box too.